The idea of a disposable ashtray came to me when i was having a Sunday afternoon drink with some friends. The cigarette bin was dirty, tired and required a key to be emptied. 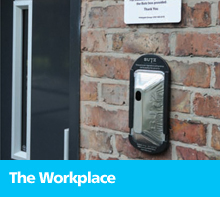 A clean and safe environment is essential for the comfort and safety of your customers and employees, and enhances the image and appearance of your business.With Butz your visitors and staff dispose of their cigarettes in the neatly designed container, that fits neatly in the wall mounted or free standing backing plate. The container is disposed of and replaced daily or when it is full - it will easily take 150 to 200 cigarette ends. The 'Smoking Area' sign makes it easy to create an external smoker's area, where people can smoke safely and comfortably without harm to other people. All Butz components are made of 100% recycled materials and can again be recycled. The containers are made of aluminium paper and are disposed off with the company litter. 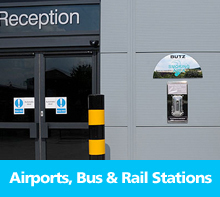 And the good thing, Butz is cheap, as it will save you on your cleaning and maintenance costs. Replacing a Butz container takes less time than it takes to clean a conventional ashtray. That's why facility management companies love Butz! 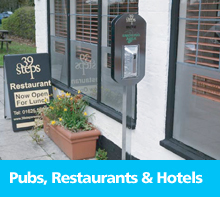 If you are looking for an upmarket appearance to your company entrance or smoking area you can opt for our luxury chromed pcb or brushed metal Dibond backing plates, that can be equally wall mounted or free standing. The pcb backing plate provides additional space for your logo, advert or other messages, whereas the Dibond plate is especially weather-resistant. Our luxury BUTZ stand in chromed metal is ideal for open areas such as terraces, outdoor receptions or garden parties. The stable and sturdy stand can take two BUTZ backing plates to provide two containers to your visitors. It will take all types of BUTZ backing plates. Butz is worldwide patented and unique on the market. The unique BUTZ disposable ashtray finally makes tired ashtrays and smelly cigarette butts at the entrance of your company or around your smoking area a thing of the past. 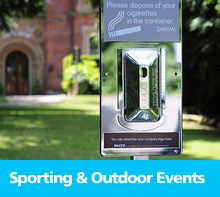 The ashtrays can be easily removed from the dispenser and replaced on a daily basis with a fresh one.